At a time when the most devoted tourists can take in twelve countries and nine capitals in just two weeks – YOU should be able to conquer Paris in a one day! And it isn't just doable, it can also be great fun. 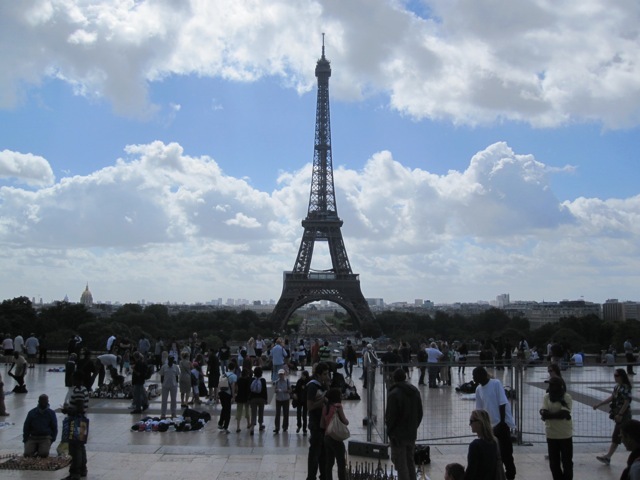 So come and get your share of Paris from a walking tour of its most scenic landmarks! And get a sense of Paris, too. 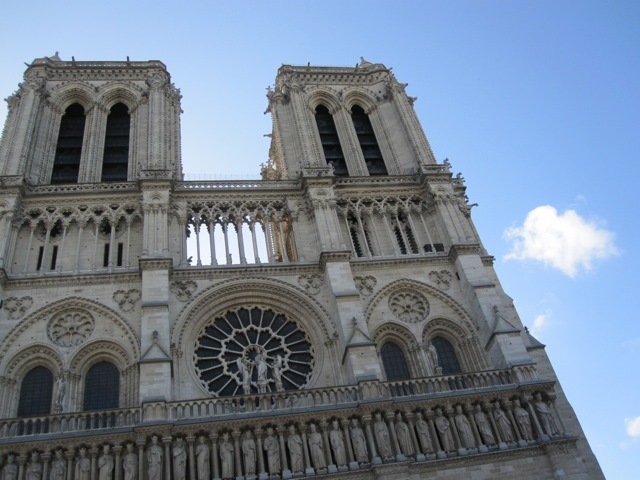 Here’s an unforgettable tour, crafted and tested for you by Mad about Paris. Actual walking time will be between 3 and 4 hours, depending on your speed. That sounds like a real trek! But you won’t regret it. We've attached a google map; print it out, and together with the instructions and details below, you should be fine! The early bird catches the worm, so try to start out early. Before 9 o’clock the city feels fresh, not many shops will be open yet, and the cleaning brigades will be stilling roam the streets as you drink a nice cup of coffee and a gorgeous "pain au chocolat" at Le Café français, sitting right on Place de la Bastille, on the angle with Rue St. Antoine. If the sun is shining, it will be rising above the Bastille opera house right about now, as you take a photo of "The Genius of Liberty" high up on its column. It was erected in 1830 to commemorate the victims of the revoltion of the same year. 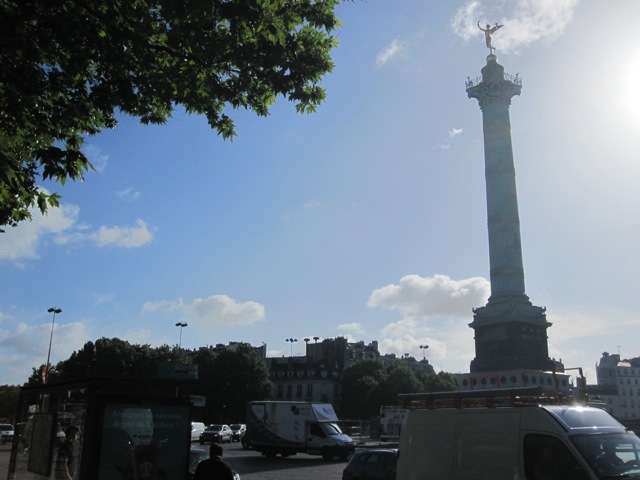 You won’t find the large fortress, "la Bastille" itself, on the Place de la Bastille anymore. The revolutionaries of 1789 tore it down in a few months...but if you look carefully at the pavement, you'll see a line running round the circumference of the "Place", marking where the notorious prison once stood. Let’s start moving. Go down Rue St. Antoine, say hello to the famous playwright Beaumarchais on the small square on your right hand side (Beaumarchais wrote the words to Mozart’s "Figaro"!). Cross over the road, walk pass the statue and take the narrow Rue des Tournelles, which dates back to the Middle Ages. Here, Molière read his plays in literary salons, imagine! 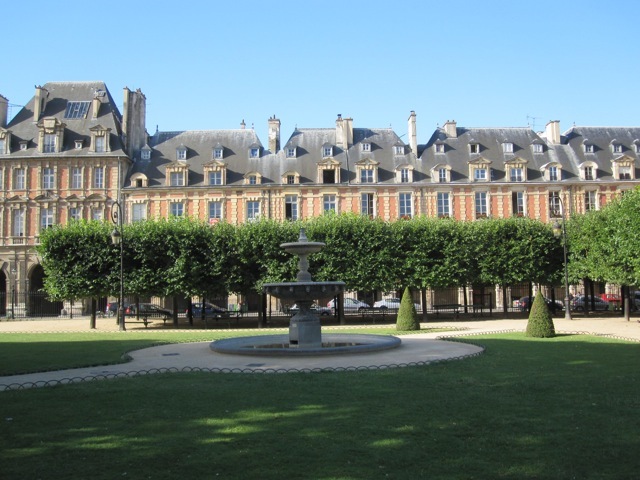 Nowadays it’s just one of the very many picturesque Marais streets leading to the first big hit of your day trip: keep walking, and on the left hand side, you'll find your way to Place des Vosges, which many people rank first place in the beauty contest of the squares of Paris. Here you are: 36 urban palaces, 9 on each side, forming a very romantic scene (the red-and-white-pattern is called: "briques et pierres"). The square was opened in 1612 by a three-day-long feast. The French king Louis XIII was present, along with his bride Anna of Austria. Walk around a bit and study the plaques on the walls of the buildings. 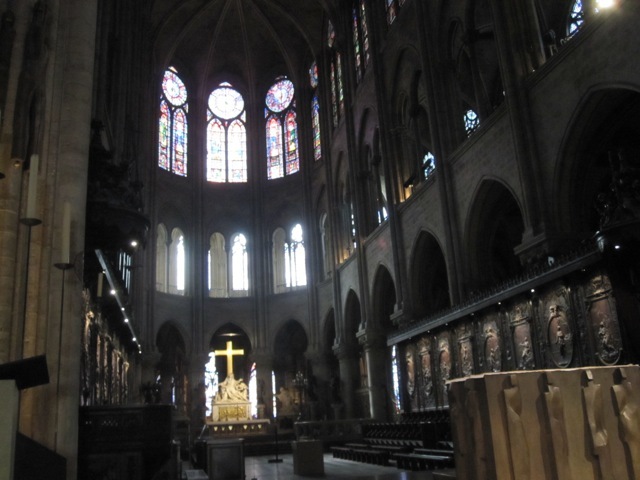 Among other things, you'll learn about the famous cardinal Richelieu and the novelist Victor Hugo (the creator of Quasimodo,"the hunchback of Notre-Dame"). Hugo was a resident here for 16 years. At number 9 you’ll find the entrance to one of the world’s best restaurants: L’Ambroisie. Bring a lot of money with you if you want to eat here! You’re moving again, time is precious, so go round in a full circle and leave Place des Vosges by the tiny Rue de Birague. Cross the boulevard and find the Rue du Petit Musique on our left hand side which will lead you straight to the river Seine. Enjoy the calm and cool atmosphere of a real Parisian neighbourhood while walking. This is the Marais street scene at its best. You’ll stumble across "Le temps des cerises", an ancient bistro, and lots of small shops offering all kinds of craft objects. After a short while you’ll reach the Saint Louis bridge, "le pont Saint Louis". Don’t you just walk over it! Take a look to your right where the Paris city hall, "Hôtel de Ville" is tucked on the banks like a fairytale castle. Look around! You’re in Paris, and here you can really feel it! The earlier you arrive, the better it is: around the next corner you’ll get a first glimpse of Notre-Dame, the most visited landmark of Paris. If you’re late, you’ll walk into a stream of other people! Construction work on this majestic cathedral started back in 1163, and almost 200 years later, a masterpiece of gothic art emerged: 130 metres long, the towers 69 metres high - it must have felt like one of the wonders of the world - and it still does. Stroll alongside the church and admire the gargoyles shaped like devils and frightening beasts. Ignore the souvenir vendours that are only here to make money out of you. Walk on, and if you’re here around 9 o’clock or shortly after, there won't even be a queue at the entrance, even during high season (the church opens at 7.45am on weekdays – at THAT time, you could be the only one in there, which is a magic experience). And when you go in, please switch off your phone, will you? You say good-bye to Notre-Dame and walk towards Rue de la Cité, turn right, then left and you’ll arrive at Boulevard du Palais. There’s so many things to see here, you might think of visiting "la Sainte Chapelle" but you only have a day, remember? So skip it, turn right into Boulevard du Palais and find on your left hand side the Palais de Justice, the Paris High Court. Have a look: it was here, to the right of the majestic stairways, where the carts containing condemned men and woman during the French revolution left the Palais, heading for the Guillotine. It was here, too, in a vast labyrinth of palaces, where French kings held court during medieval times and for many centuries afterwards. 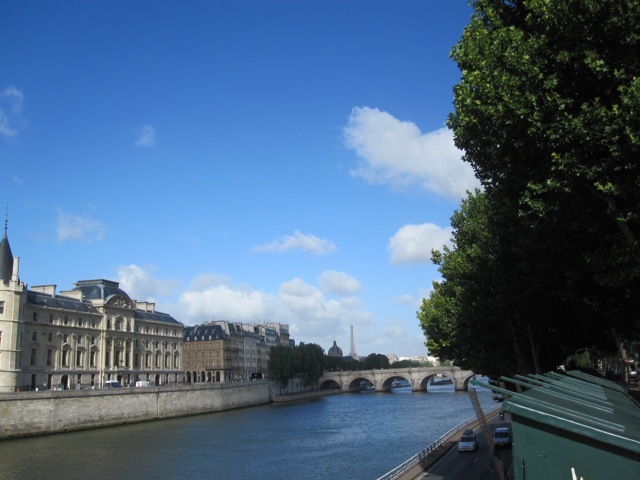 Go straight down the Boulevard du Palais and find yet another bridge over the Seine river, "le Pont au Change." A first bridge was built here around the year 1000, destroyed in 1280, then rebuilt, then destroyed again and rebuilt, and so on, but anyway: step onto this bridge and you’ll have a nice view of the famous Pont Neuf right down the river. It was built in 1578 and is the oldest bridge of Paris still standing. So what you see is still the real thing, you’re looking 450 years back in time. Take a photo, this is a memorable moment. And then: move on! Straight ahead of you Châtelet comes into view, there’s only one tower left, cross the river towards the tower and then zigzag a bit to finally turn left into Rue de Rivoli, one of the major traffic axis of Paris and a marvellous, bustling street. Here, you’ll find all the big brand names of the world and if you feel like shopping this might be the moment to open your wallet and let yourself go. Once you decide to head on, you’ll get a first glimpse of the Louvre. It will appear on your left hand side, where the Rue de Rivoli meets Rue du Louvre, and the size of the building will stun you. But you ain’t seen nothing yet! 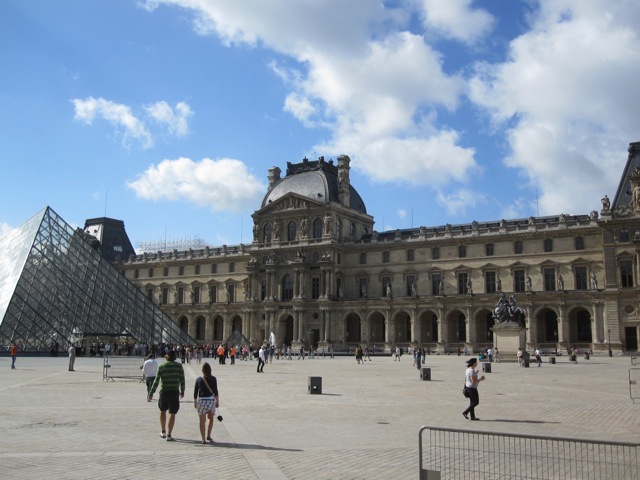 The Louvre might be a museum first but it represents almost 900 years of architectural history as well. A first fortress was erected in 1190, and then king after king (and later on even the elected presidents) expanded the royal city palace that boasts of more than 60.000 square meters (650.000 square feet) of exhibition rooms. Depending on your speed, it might be time for lunch already. If so, you could have a decent meal at Le Fumoir right opposite this very far end of the Louvre. If you don’t feel like eating yet, just go on walking the Rue de Rivoli along the Louvre and then sneak in to get a better idea of the grand palace. Where Rue de Richelieu comes in from the right, turn left passing through huge gates and there you are: you’ll see the pyramid and all the aisles of the vast palace, you’ll see the the Arc de Triomphe du Carrousel nearby, the Tuilerie gardens behind it, and if you look even more closely - the "real" and nd world famous Arc de Triomphe can be seen far away on the horizon. You would probaly like to conquer the great galleries of the museum right now. But if you do, you will never do "Paris in a day". Remember that year after year 8.9 million visitors come to the Louvre. Save it for next time, there’s more things to see! Get back on to Rue de Rivoli, cross it and turn left into the magnificent Rue Saint-Honoré, an ancient axis dating back in some parts to the 13th century. It has been home to scores of famous writers, artists, aristocrats, cardinals. At number 109 for instance, the barber of Louis XIV once lived, at number 161 you can find an old gate that Jeanne d’Arc and her troopers beleaguered in 1429 to take Paris back from the Englishmen. The assassin of King Henri IV stayed at a hotel here, the poet La Fontaine was a resident for over 20 years. Molière was born at number 96 and Pierre Corneille was buried in the St. Roch church at number 286. 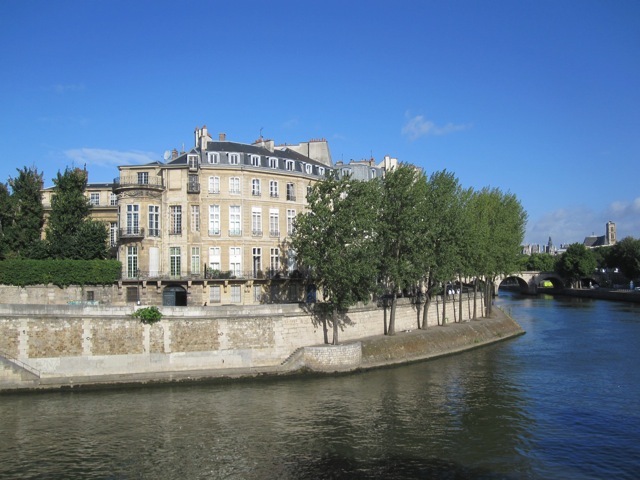 In Rue Saint-Honoré you will walk the paths of Jean-Jacques Rousseau and of the German brothers Grimm who were enchanted by Madame d’Epinay who lived at number 239 – and we could go on like this for quite a while. 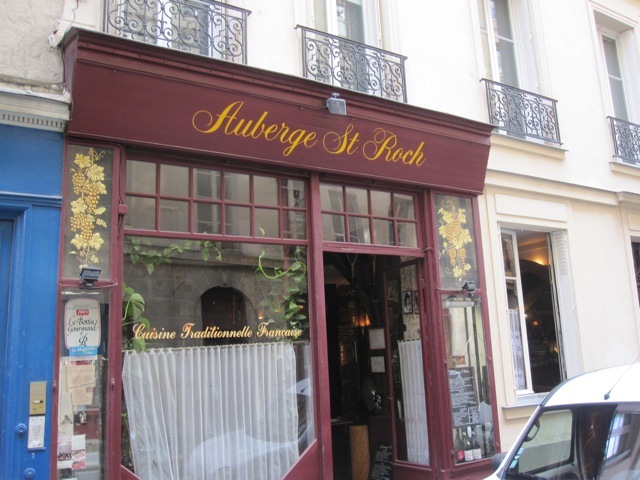 You must be hungry now – that’s why you turn into the Rue St. Roch just to find the Auberge St. Roch at number 33. It’s a nice, typical bistrot serving good food at reasonable prices. Try to be there at 12h45 or so, then you should get a table without a reservation. After lunch, leave the bistrot, turn left and head for Avenue de l’Opéra, a grand old boulevard, turn left again and spot the great outline of the old opera house of Paris, "Opéra Garnier", opened in 1875 and a classic example of architecture under Napoléon III. Admire the facade and then move on. It’s Paris in a day! You can do it! Enter the noble Rue de la Paix and go straight on. Here, at number 17, the celebrity chef Antoine Carême ran a Pâtisserie, in number 5 the banker Paquin founded a once world famous fashion brand, employing 2700 workers right here, imagine! Further down the street you can already see the high column at the center of Place Vendôme, yet another urban miracle and one of the best examples of the classy style of Paris. Surrounded by high-end jewellery boutiques and the Ritz hotel, it was constructed in 1686 mainly for infrastructural reasons, to take pressure off the overflowing Rue Saint-Honoré. César Ritz founded his hotel chain here, Danton worked as a Secretary of Justice after the revolution in the building next to the Ritz. Composer Frédéric Chopin died in number 12 and, and, and.... The bronze column you see was made of 1250 Russian and Prussian canons taken in the battle of Austerlitz, it was first inaugurated in 1810. Time to move on! Turn right into Rue Saint-Honoré again, stuffed here with fancy boutiques and flagship stores and walk up to Rue Royale. At the corner to your right you might think of buying some macarons and other sweets at Ladurée. Cross Rue Royale and wait for a moment when you’ve reached the middle of the road. To the right you will see "la Madeleine", a neo-classical temple, to your left you’ll get a first sight of Place de la Concorde. That’s where you'll head to now. 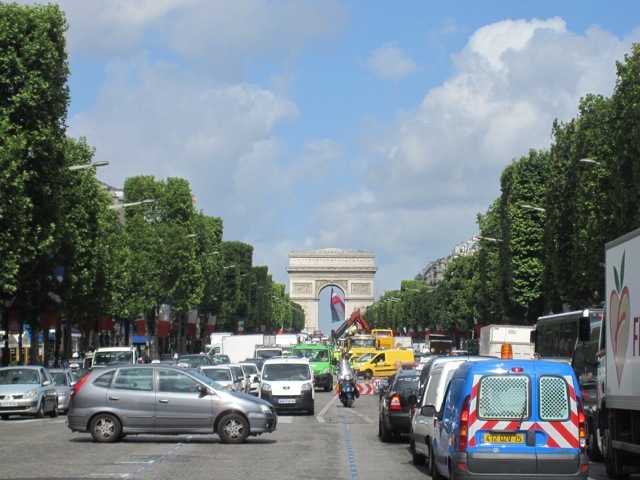 Follow the Rue Royale and enter this large square famous for its infamous traffic. Look around a bit. This was the spot where the grand Guillotine was at work during the years of terror following the French revolution. Of the 2498 people who were decapitated in Paris during those years, 1119 lost their lifes here, amongst them: King Louis XVI, Marie-Antoinette, Danton, Robespierre, Saint-Just. The obelisc you see today was erected in 1836. Pass by Hotel Crillon (opened in 1907) and stroll through the gardens between Avenue des Champs-Elysées and Avenue Gabriel. Keep on walking or sit down for a minute or two on one of the benches. You don’t have the time (or the nerves) to hear all stories linked to this world famous avenue. First plans to build it date back to the 17th century but construction work only started in the 1770s. Back then, the "fields of Elysium" (in Greek mythology the part of the underworld where fallen heros were buried) was an empty, dark land where thieves and prostitutes reigned the night, and it was onlyproperly developed in the 19th century. Embassies started to move in, theatres, circusses, news organizations, restaurants, grand cafés, and over time it became the flower of Paris. Walking here, you might feel a bit disappointed though. Is this it?, you might think, because it's only when you cross the large avenue that you get a feeling for its grandeur. From a sidewalks’ perspective it feels just like a huge shopping mall, with a lot of world brands. But what about the famous charm and flair? It’s not that easy to detect. That’s why the Parisians do not really flock in but leave the turf to the visitors. You must take a photo of Arc de Triomphe though. People at home expect you to! Enter Rue Pierre Charron and get away from the Champs-Elysées. This street is not a big hit in itself but it leads you directly uphill to the glamorous final of your Paris-in-a-day-tour. You might think of taking a break and having a coffee in a bar on your way, there’s plenty of them, or you just keep on moving straight ahead. Rue Pierre Charron will turn into Rue Pierre 1er de la Serbie, lined with monumental bourgeois buildings, abundantly decorated and very Parisian. Further up the street, the beautiful museum Galliera will show up on your left hand side. 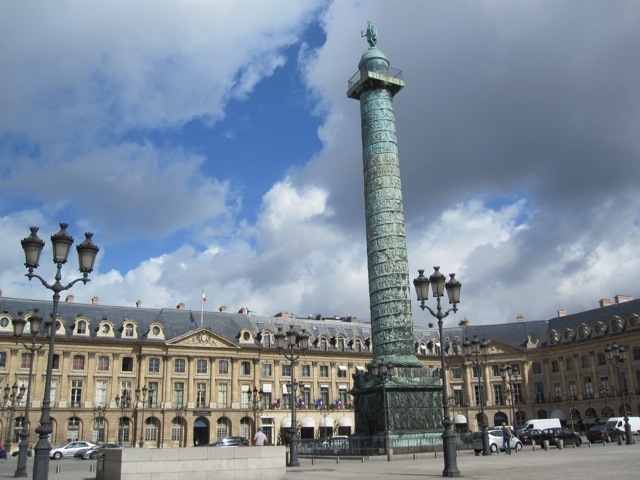 You’ll reach Place d’Iena soon, named after yet another French victory on Prussian grounds, in the center of the square a Washington is sitting in bronze on a horseback. Cross the square and move on uphill, following the avenue named after President Wilson. Only a few more metres to go now! It’s always a nice scene to watch tourists stepping out of the Metro at "Trocadéro": you can see that they’re desperately looking around for something important but they don’t spot it right away. You’ve done it the better way: coming all your way from Place de la Bastille, you’ve already glimsped the Eiffel tower every now and then, now you just keep left and finally you’ve reached the finish line. Before your eyes, a spectacular panorama is opening up. 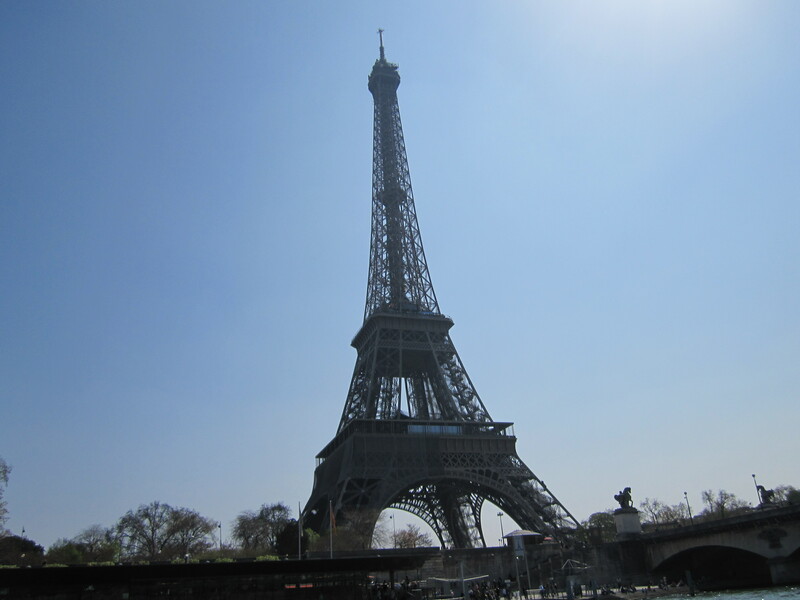 There it is,"la tour Eiffel", one of the most famous landmarks of the world – and it IS beautiful. Constructed for the World Exhibition of 1889 (and judged appallingly ugly by many people back then), it was a proof of Paris’s claim to be the capital of the world. Today, it’s just a miracle of urban development. You feel like visiting the tower? It’s tempting, in fact: high up on the top platform you’re 276 meters above the ground and on clear days your view commands a full circle of a 40-kilometres-radius. If you want to visit, plan well ahead and buy your elevator tickets online, the sooner the better. For now: congratulations! You’ve done Paris in a day. Time to have a drink now and digest the many impressions you had. 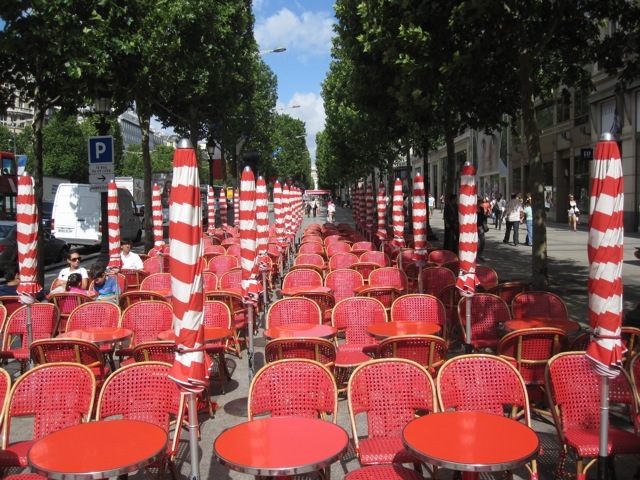 On the other side of the Trocadéro square you’ll find a whole bunch of cafés and bars. And after this, you’ll sleep like a stone.